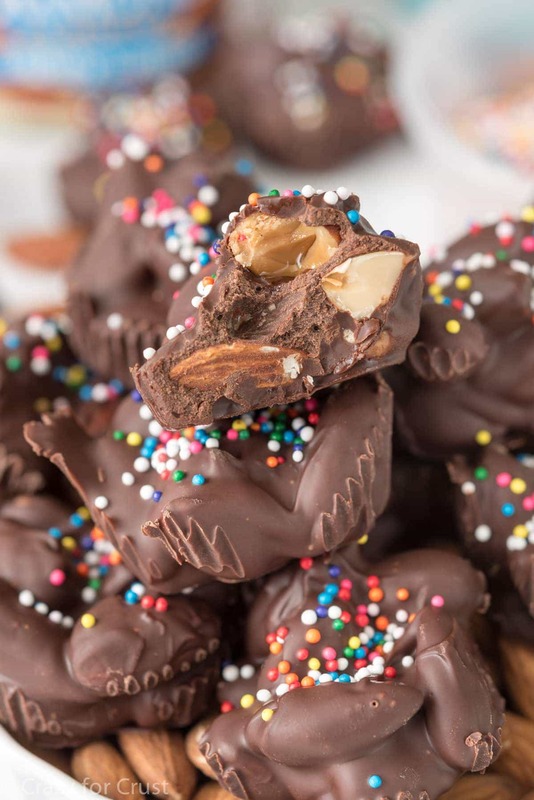 Almond clusters are the perfect last minute treat to make this week! 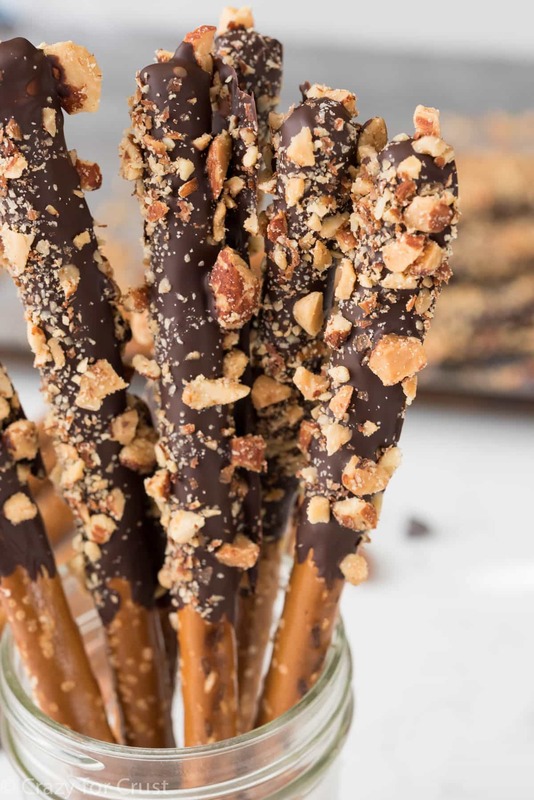 3 ingredients and 10 minutes of time is all you need to make this easy candy recipe for the holidays! It’s a great food gift idea. I love my daughter for lots of reasons. I mean, obviously, she’s my daughter. She’s a good kid, she thinks of others, and she’s hilarious. I kind of picture us like Rory and Lorelai, except there’s more yelling and less coffee. One of the main reasons I really love her right this minute? She wrapped all the Christmas presents – and all the stocking stuffers. All of them, except her own. She loves wrapping presents. I hate wrapping them. It’s a great pairing, until I realize I still have to wrap all of hers. Do you give homemade treats for Christmas? Every year, I make tons of goodies for teachers and school staff, for neighbors and friends. I dream up new recipes for each of the grandparents and wrap up tins of cookies and candy and fudge, just for them. Yeah, that’s not happening this year. Sorry, family. This year, I am going to spend Christmas week baking what I want to make. Snowballs and blossom cookies, sugar cookies and toffee. But…I had to make one thing for my mom. I had to make her almond clusters because, well. I just couldn’t not make them. The problem? Not eating all of the almond clusters before Friday. 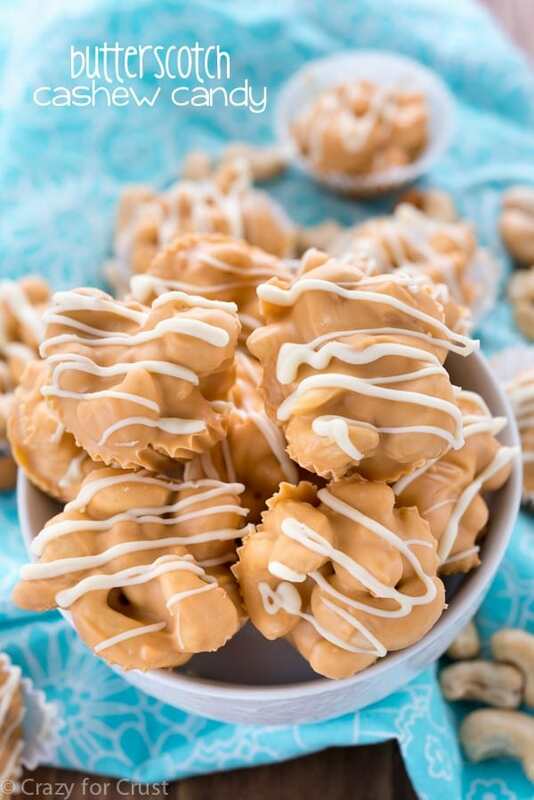 These EASY Almond Clusters have only 3 ingredients. Sure, the sprinkles make it 4 ingredients, but they’re optional. Either way, did I mention they’re easy? The take less than 10 minutes of prep time and they taste way better than anything you’d get in the candy aisle. 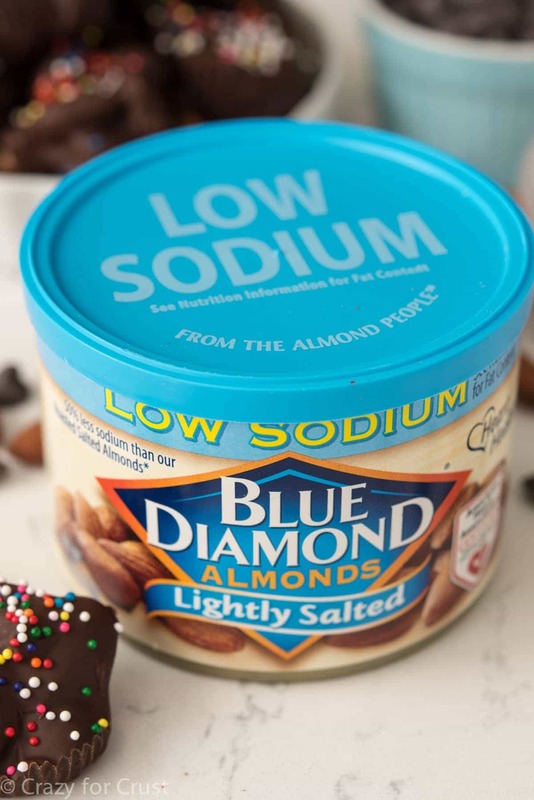 I started with my favorite almonds, Blue Diamond Lightly Salted. I always have a container or six of those lying around. 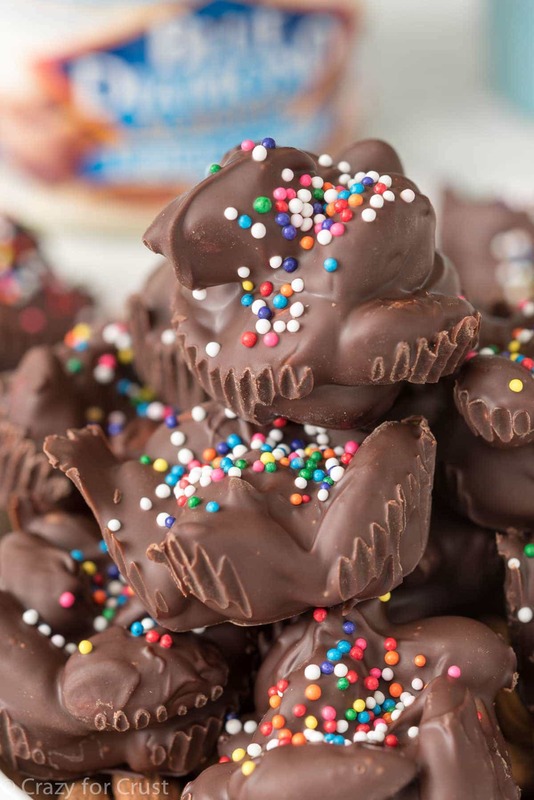 That, some chocolate chips, and some vegetable oil are all you need to make homemade Christmas candy. I’m not joking about how easy these are, I even made a video to prove it (see below). Why the vegetable oil, you ask? Well, I often have trouble with melting chocolate chips, especially in winter. They get too hot or they’re old and they seize while baking. I always add a little oil or shortening to them before heating, and it helps the chocolate melt smoothly. Just make sure and follow the instructions – 30 second increments in the microwave, stirring between each. Once it’s melted, just stir in the almonds and place the candy in mini muffin pans. I use liners for easy removal. You can even gift them in the liners if you want. Literally 10 minutes between you and homemade almond clusters. What are you waiting for?? 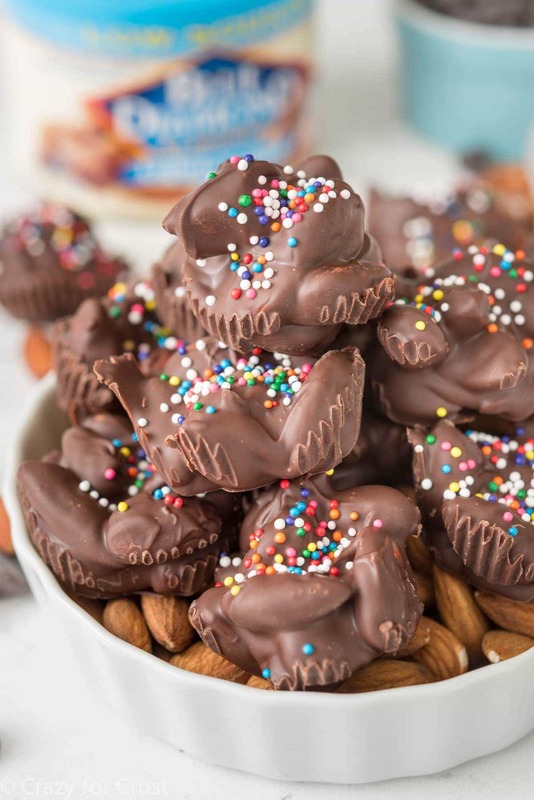 These Easy Almond Clusters have only 3 ingredients! 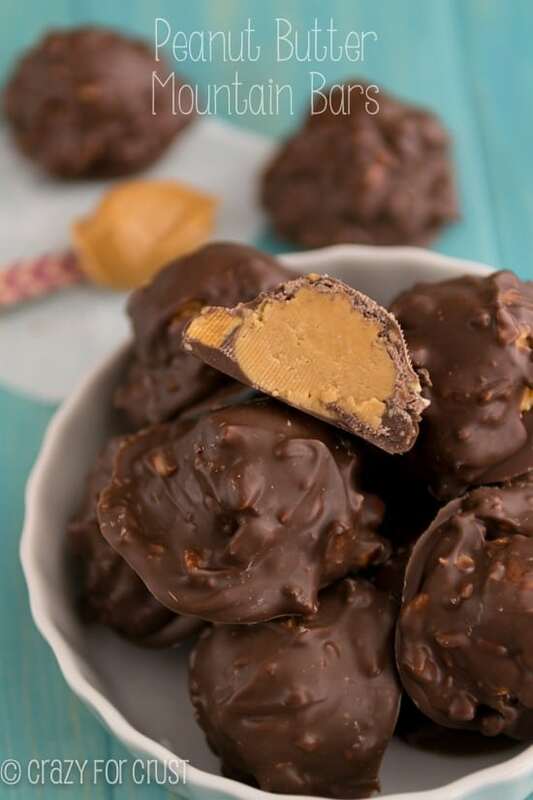 It's a foolproof recipe that makes a great candy treat for gift giving or parties. Line a mini muffin pan with mini muffin liners. Place chocolate chips and vegetable oil in a medium microwave safe bowl. Heat on high power in 30 second increments, stirring between each, until the chocolate is melted and smooth (about 1 1/2 to 2 minutes). Stir in almonds. Scoop clusters of almonds into each mini muffin liner. Sprinkle with sprinkles, if desired. Chill until set. Serve or package with or without the muffin liner! Store in an airtight container for up to 1 week (longer if you chill them). This post is sponsored by Blue Diamond Almonds. All opinions are 100% my own. I love quick and easy treats like this! I also love that you added sprinkles! Sprinkles for life!!!!! hi can i melt this using a saucepan?